Baby safety should be your first priority when you plan and set up your baby nursery ready for your precious newborn bundle. When she enters this world kicking and screaming she will be relying on you to keep her just as safe and sound as she was while she was being carried around inside you. Your baby will spend around 70% or more of her time in this room during her first year. And, because the nursery is the only room in the house where your baby will be left unattended, it requires special attention when it comes to infant safety. It includes safety information relating to cribs, bassinets, changing tables, mattresses, toy boxes, baby's bath, toys and much much more! Don't miss it! How to take baby safety into account in the nursery without sacrificing your chosen baby room design or nursery theme. Check this essential baby safety equipment guide to find all the best must-have baby safety products you need to ensure infant safety in the baby nursery and the rest of your home. Included are my top recommended products as well as a complete baby safety product store. Most baby safety equipment doesn't cost very much, so don't take any chances. - you can probably baby-proof the entire nursery for far less than you are prepared to pay for a crib bedding set. Your main infant safety concern is the sleeping environment. This is what she will spend most of her time doing for the first few months and much of the time she will be unsupervised. 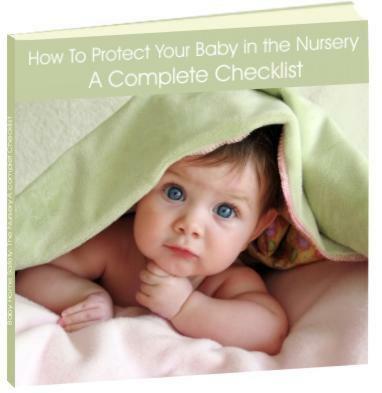 Check out the following infant safety articles to make sure your baby has a cozy, safe sleep. The crib is one of the few places you will leave baby alone. Follow these baby crib safety standards to make sure your precious baby's sleep is safe and snug. Cradles and bassinets are a great way to keep your baby close. Follow these bassinet safety guidelines to make sure your baby is not only cozy beside you but safe too. To bumper or not to bumper? That's the question. Follow these baby bedding and crib bumper safety guidelines to make sure your baby sleeps snug and safe. What is SIDS? What causes it? What do we know about it? 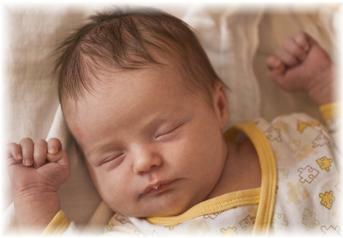 Vital SIDS baby safety information for a new mom. How can you prevent SIDS? SIDS prevention advice for your baby. Not to be missed! Co-sleeping is a great way to bond with your precious newborn. Find out how to co-sleep safely and what infant safety measures you should be taking when you lay your little one down beside you. There are many ways to cosleep safely. Find out what your cosleeping options are here. A list of 10 essential safe sleep baby items. Sleep easy knowing that your precious baby is safe and sound. When your new born baby isn't sleeping, chances are you'll either be bathing him, changing his nappy, feeding him or taking him out and about. Outside of his secure sleeping environment, your delicate little one will be that much more vulnerable to hidden dangers. You will rely on the baby furniture and equipment you choose to help you to keep your fragile baby safe at these times. Check out the following infant safety articles to make sure your baby nursery furniture and equipment is safe to use. Follow these baby furniture safety guidelines to make sure that the nursery furniture you choose for your baby doesn't cause any accidents in your nursery. Bumbo Baby Sitters are worth every cent, but many moms are worried about baby safety issues associated with them. Because of this they miss out on one of the best baby items I ever bought. Find out how a few simple precautions will ensure your little one stays safe and happy in her bumbo baby sitter. Important nursery lamp safety issues to take into account when planning your nursery lighting. Think ahead - one day soon you'll be dealing with a troublesome toddler, not an innocent, bouncy baby. Despite your best attempts to protect your baby, accidents do still happen every now and again. They range from a fairly harmless scratch to a life threatening poisoning. It's important that you know what to do in the case of illness or emergency. The best way to be prepared is to have a few well chosen infant health books on your shelf. Basic first aid to deal with bumps, bruises and minor burns etc. Emergency care to deal with choking, poisoning, major cuts and burns etc. Common Illness to deal with fever, rashes, spots etc. None of these books will take the place of a visit to the doctor or emergency room, but they will help you to identify the best course of action, and in the case of an emergency, any steps to take while you wait for the professionals to arrive. The more knowledge you have, the better you can ensure that your baby receives the help he needs. You will find a selection of my favorite infant health books at the infant health book store. Read the reviews, look inside the books and choose a few books that may one day end up saving your little one's life. Do you have an especially tall baby? Are you an especially tall parent? From infant car seats to baby strollers, baby slings to baby gliders and other new baby gear, being tall makes a big difference! Some standard baby gear is useless for tall babies. Other items are downright dangerous. Don't forget to check out the latest recalled baby products here. The above infant safety information is presented by Creative Baby Nursery Rooms for the purpose of educating mothers about baby safety issues. We believe that the information provided on this site can help prevent baby nursery accidents, however, an infant's safety is the responsibility of its caregiver alone. Creative Baby Nursery Rooms accepts no responsibility for any baby nursery accident, which may occur as a result of any information on this site.